A missal contains all the prayers and readings for the celebration of mass. Usually a missal also contains a calendar because its user would need to determine the dates of saints' days and the feasts of the church to know which readings were correct for the day's mass. This missal, a rare survival from a pre-Reformation English church, was for use by a priest. Its beautiful decoration may be due to association of the church, All Saints, Maldon, in Essex, with the monastery at Beeleigh, through which the church might have acquired it, or the parish could have commissioned it from a workshop in London or elsewhere. All Saints. Maldon, has very beautiful stone carving in its nave which could have been about contemporary with this missal. This page is from the calendar and has July. The days are numbered according to the Roman system, in use throughout the middle ages, of kalends, nones and ides. 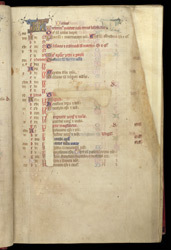 Important feasts and days of saints especially venerated at Maldon are written in blue or red ('red-letter days'). To the right of the list of feast days, the note "vigil" indicates a special service on the eve of the feast. The missal is known to be from All Saints, Maldon, because the calendar has the feast of the anniversary of its dedication.